Cadets of various grades and ranks pose for a photo Thursday at Hayes High School. From left to right: Patrick Beck, a sophomore at Hayes and second year cadet; A.J. Bell, a junior at Olentangy Orance High School and third-year cadet; Alex Naugle, a senior at Olentangy Orange and fourth-year cadet; and Adam Willis, a sophomore at Hayes and first-year cadet. Delaware County Air Force Junior Reserve Officer Training Corps (AFJROTC) is looking to grow, and the cadets in the program say it’s an opportunity to develop skills and relationships. Retired USAF Lt. Col. F. Russ Anible oversees the program at Hayes High School, but the program includes cadets from the county’s eight high schools. Anible said because the general public usually only sees the cadets in their formal attire at events, it can cause some misconceptions. 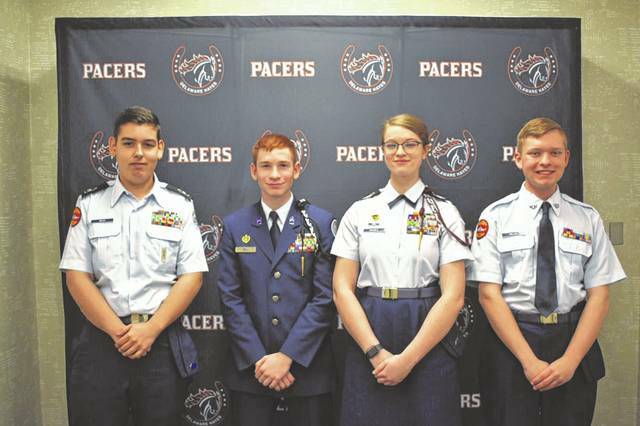 Anible said that 85 percent of AFJROTC cadets don’t pursue careers in the military after high school, but the skills they learn in the program and class carry to virtually every career path. A.J. Bell, a junior at Olentangy Orange High School and third-year cadet in the program, said Thursday that when he join the class as a freshman, he was reserved. After spending time in the program, however, he’s learned how to better interact with people. Bell said the class puts students in leadership roles, whether they think they are ready or not, and the experience teaches students a lot about themselves. Bell said he’s planning to attend Indiana State University to study unmanned programs and join the ROTC after graduation. Bell currently leads the drill team for the Delaware County AFJROTC. Naugle, who is the cadet lieutenant colonel and commands the cadet corps, said she thought the program would be “all formal, all the time,” but she said it’s been “a lot of fun.” She added eighth-graders should try it. Naugle said she also plans to enlist in the USAF and plans to study to be a behavioral health specialist. Patrick Beck, a sophomore at Hayes and second-year cadet, said he plans to study commercial aviation after he graduates, and the class and program have taught him essential skills. Adam Willis, a sophomore at Hayes and a first-year cadet in the program, said the program has helped him develop as a person and foster friendships. Anible said the class is an elective, and all of the other activities like compressed-air rifle marksmanship and drill team are optional. Anible added the class qualifies for the physical education waiver, and eighth-grade or high school students only need to speak to the counselors to join.